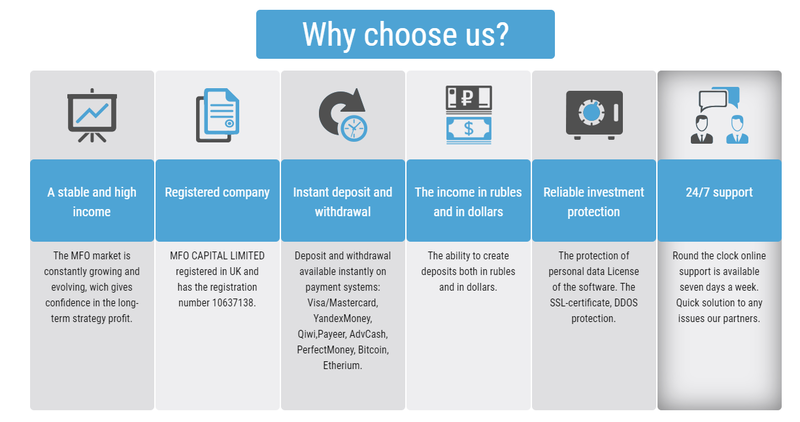 MFO CAPITAL LIMITED is a leading company in the field of lending to microfinance institutions, registered in the UK, registration number 10637138. MFO CAPITAL is on the market since 2017. During this time our team has developed a robust investment strategy in IFC and ICC. 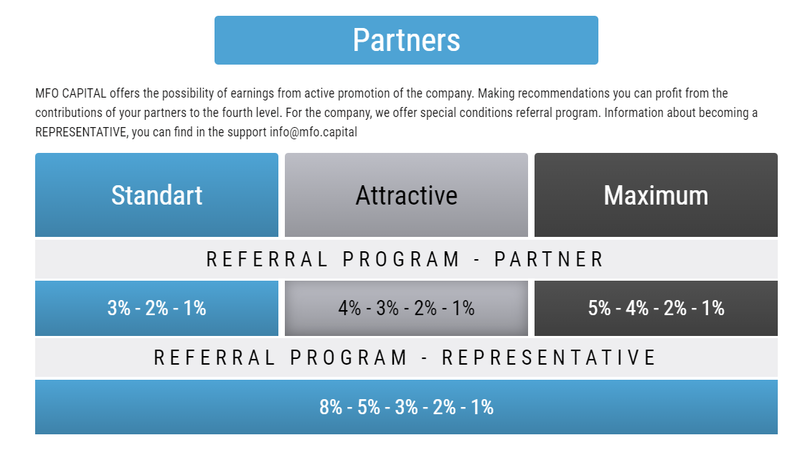 We has implemented an online platform https://mfo.capital to facilitate cooperation with the company and income from its activities. The main business of MFO CAPITAL - issuance of short-term and medium-term loans of microfinance organizations, operating on the territory of the Russian Federation, CIS and Europe. 3. Free loan up to 60% to the deposit! 5. Balanced and profitable marketing, with a fast payback period. All responsibility for the safety of your money lies only on you. mfocapital	+8.91 Received Payment 8.91 USD from account U18866291. Memo: API Payment. Fairmonitor. mfocapital	+6.83 Received Payment 6.83 USD from account U18866291. Memo: API Payment. Fairmonitor. mfocapital	+9.21 Received Payment 9.21 USD from account U18866291. Memo: API Payment. Fairmonitor. mfocapital	+6.53 Received Payment 6.53 USD from account U18866291. Memo: API Payment. Fairmonitor. mfocapital	+10.05 Received Payment 10.05 USD from account U18866291. Memo: API Payment. Fairmonitor. mfocapital	+2.52 Received Payment 2.52 USD from account U18866291. Memo: API Payment. Fairmonitor. The amount of 200 USD has been withdrawn from your account. Accounts: U2917300->U17411939. Memo: Shopping Cart Payment. hyipregular.. Date: 13:48 22.02.19. Batch: 247541269.
mfocapital +15.8 Received Payment 15.8 USD from account U18866291. Memo: API Payment. Millioninvestor. 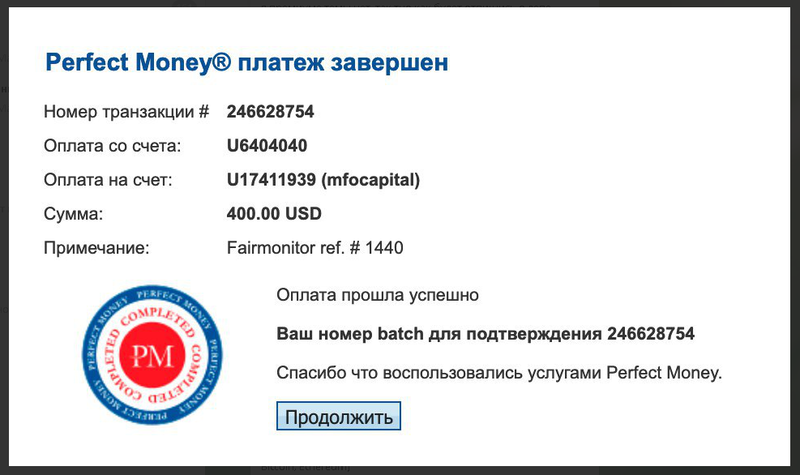 mfocapital +14.03 Received Payment 14.03 USD from account U18866291. Memo: API Payment. Millioninvestor. mfocapital +16.83 Received Payment 16.83 USD from account U18866291. Memo: API Payment. Millioninvestor. MILLIONINVESTOR.COM - МАКСИМАЛЬНЫЙ БОНУС И ЗАЩИТА ОТ ПОТЕРЬ! mfocapital	+2.38 Received Payment 2.38 USD from account U18866291. Memo: API Payment. Fairmonitor.